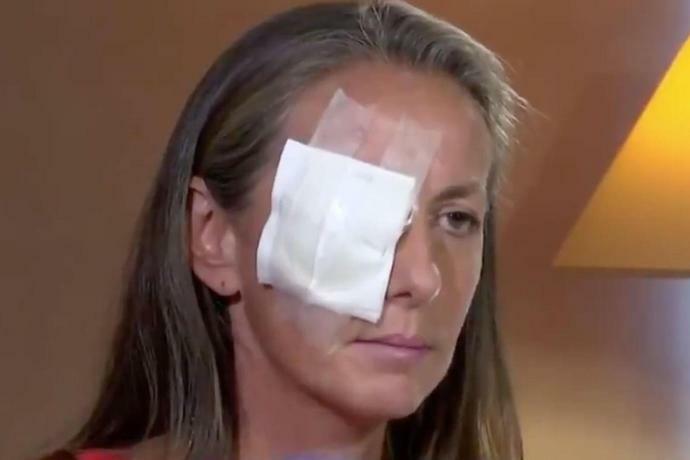 The woman whose eye "exploded" after being hit by Brooks Koepka's golf ball at the Ryder Cup says she is taking steps to make sure it doesn't happen to anyone else. Corine Remande, 49, and her husband Raphael, who also attended the event on Sept. 28, spoke to Today about losing vision in her right eye and her potential plans to sue the organization that runs the tournament. "When the ball hit my eye, all my eye exploded," Remade recalled in an interview the morning show aired Friday. "And immediately my sight is finished for me. My first question is how to live now with only one eye?" Raphael, who had to explain the extent of the damage to his wife, said through tears, "It was a difficult time for sure. It's still difficult. The doctor told me she has very big damage in her eye, and she will never recover the sight. But she was stronger than me at this time for sure." The Today report indicated that doctors told the couple that Remande could've died if the ball had taken a slightly different path. Remande clarified that she doesn't blame Koepka, 28, who hit the errant ball. "From the player, there is no fault," she said. "I'm just angry about the organization and all the marshals." Remande said she plans to take legal action against tournament organizers because she believes officials could have done a better job to warn spectators about the danger. "She insists marshals on the ground did not verbally alert spectators to the danger of Koepka's shot, and there wasn't adequate signage to warn about the risks of errant balls around the course," the Today report said. "She also claims that officials did not follow up about her condition while she was in the hospital." Organizers for the Ryder Cup did not immediately respond to PEOPLE's request for comment, but a spokesperson previously refuted her allegation to the AFP, saying, "We can confirm that 'fore' was shouted several times but also appreciate how hard it can be to know when and where every ball is struck if you are in the crowd." Officials also emphasized to Today that they offered her help immediately. "I don't want to change all the rules in golf," Remande continued. "I just want to improve the safety rules." Remande shared exactly what happened to her with the AFP earlier this week. She and Raphael had jetted from Egypt to France to attend the golf tournament. After Koepka's shot came barreling toward her at the sixth hole on Friday, Remande suffered from a fractured eye socket and a damaged eyeball - what was described to the AFP as an "explosion of the eyeball." "Doctors told me I had lost the use of that eye," Remande told AFP, according to CNN. "It happened so fast, I didn't feel any pain when I was hit. I didn't feel like the ball had struck my eye and then I felt the blood start to pour." She said she's motivated to take legal action because "quite clearly, there is responsibility on the part of the organizers… Officials did not shout any warning as the player's ball went into the crowd… More than anything I want them to take care of all the medical bills to make sure there is no risk of infection." "She was bleeding pretty good," Koepka said on Friday, according to Golf.com. "It looked like it hit her right in the eye, so hopefully there's no, you know, loss of vision or anything like that." According to ESPN, Koepka, who reportedly apologized and gave her a signed glove, also said, "You don't want to hit anybody in the face, especially not a woman, and it's not a good feeling." Steve Williams, who caddied for Tiger Woods for 13 years, was as transfixed as any observer when his former employer made a run to his fifth Masters title earlier this month. Williams, who retired to his native New Zealand in 2017, told ESPN in a story published Monday that he hadn't watched any golf on television since retirement -- until Woods was making a run on Sunday at Augusta. Williams said he tuned in from New Zealand -- where it was around 5 a.m. on Monday -- as the final grouping was reaching the 15th hole. Tiger Woods turned back the clock last week, but presumably he did not turn it back to the 2000s, when any tournament without him was consigned to the remainder table. Woods, a fifth green jacket notwithstanding, is not likely to dominate, not at 43, battered and bruised and unable to commit the time he once did to preparation, while also facing a surfeit of talent unafraid of the challenge. For golf not to devolve again into a tour of the haves and the have-nots, the latter tournaments with fields sans Tiger, it needs the best players in the world to do their part to ward off apathy when Woods is not there to do it for them. One week ago Sunday, Tiger Woods won the Masters, a sequence of words that still feels funny to write. For all the reasons that has made Woods the most compelling figure in golf for the last two decades-through extraordinary highs and humiliating lows-those are the reasons why his one-stroke win at Augusta National has become the biggest story not in just golf in recent memory, but in sports, and possibly beyond. Tiger Woods' 15th major was improbable and familiar all at once.